The Trindade Theater will take to the stage, “The Night” the first play written by José Saramago. It will be on stage till January 19th. . On 11th and 12th and will have audio description available for blind people . This system does not interfere with other viewers of the show . 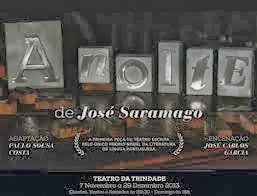 This piece was adapted by Paulo Sousa Costa , has the enactment of Jose Carlos Garcia and features actors Vitor Norte, Paulo Pires , João Lagarto , Pedro Lima , Joana Santos , Sofia Sá da Bandeira, Samuel Alves and Filipe Crawford .